Chelseaâ€™s John Terry and assistant coach, Henk Ten Cate, are said to have had been involved in a bout of training ground fisticuffs before the Carling Cup Final, which any pundit will no doubt tell you, â€œhappens all the time at every club in the countryâ€. You’d think that they would save their aggression for the opposition but here is our list of top ten fights between team mates from the training ground to the pitch. The Israeli took offence to a training ground tackle and Big Bad John responded by kicking him squarely in the face â€“ can’t argue with logic like that! With Blackburn struggling in their first Champions League, David Batty decided it would be the best time to question Graeme Le Sauxâ€™s sexuality during the game â€“ cue handbags. Wonder where Robbie Fowler got the idea? 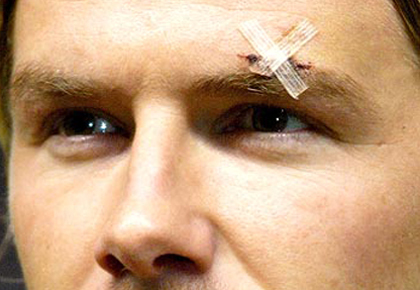 Fergie blamed Becks for a disappointing performance against Arsenal and made his point by kicking a boot into somewhere it would hurt most – his face! Becklham was literally plastered all over the papers the next day and his ticket to Madrid booked. â€œYou can stick your World Cup up your bollix,â€ was only part of the ten minute tirade that came after McCarthy confronted Keano for criticising his preparation before the 2002 World Cup – that’ll learn him!. Grobbelaar proved that all goalkeepers are mentalists by unleashing a verbal and physical assault on scrawny Macca who he blamed him for a derby goalâ€“ sure you didn’t just let that one in Bruce? Gillespie apparently spent a night out ‘bonding’ with his Newcastle team mates by giving Al some stick. The next thing he knew was waking up on the curb â€“ although saintly Shearer never got any blame. Itâ€™s claimed that no punches were thrown but strong language was used…sticks and stones etc.